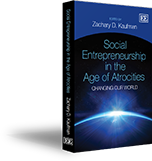 BooksGreenfield, Sidney M. and Arnold Strickon (1986), Entrepreneurship and Social Change, Lanham, MD: University Press of America. BooksGunn, Robert and Chris Durkin (eds.) (2010), Social Entrepreneurship: A Skills Approach, Portland, OR: Policy Press. BooksHammond, Darrell (2011), Kaboom! : How One Man Built a Movement to Save Play, New York, NY: Rodale Books. BooksHansmann, Henry (1996), The Ownership of Enterprise, Cambridge, MA: Belknap Press of Harvard University Press. BooksHart, Stuart (2005), Capitalism at the Crossroads: The Unlimited Business Opportunities in Solving the World’s Problems, New York, NY: Wharton School Publishing.